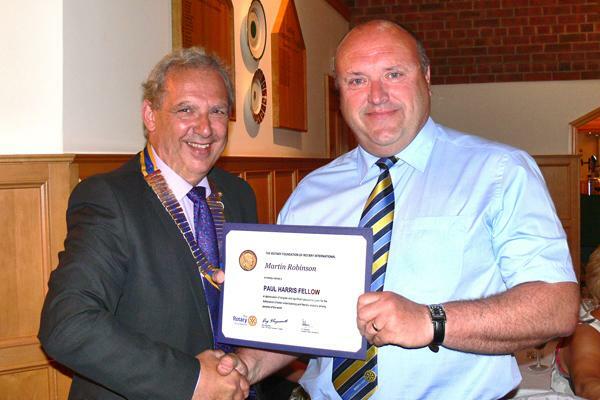 The highest honour bestowed on any Rotarian, the Paul Harris Fellowship, has been awarded to Past President, Martin Robinson. The Paul Harris carries the name of Rotary’s founding father and is awarded for exemplary service and outstanding support for the community. Outgoing President Nick Wells in presenting Martin Robinson with his fellowship explained that he was especially delighted to present the award to someone who had been there for him, throughout his presidency. Martin, is a Past President himself and a member for over 15 years; he has been a very active member involved with all major events, fundraising, the disability games, sponsored walk, recycling cycles to name only a few and more recently he even “braved the shave”. He often assumes the role of master of ceremonies, Sergeant at Arms and during his presidency he promoted Brigg so that everyone knew that we are “The Best Club in the District”. He fully deserves this recognition for his outstanding achievements. Clearly surprised and delighted by this award he said he was in shock. It was a great honour to receive this from ‘the best club in the district’. He went on to thank Past President Brian Parker for introducing him to Rotary and to Keith Alston for making him become more active in the early days. Martin said he wished to thank everyone for their support and was generally over awed.